The event which took place at Toyota HQ, saw 50 of the best motoring technicians in the Toyota Ireland network compete for the coveted award. The first stage of the contest involved an online aptitude assessment and practical skills assessment. Following this, five technicians were shortlisted for Technician of the Year. The final element of the contest was for each candidate to participate in a series of timed technical exercises, designed to challenge ability and test stamina while under pressure. Martin Kinsella, Pat Masterson, Michael Oporowicz, Owen Kavanagh and Jayne O’Driscoll of Toyota, had the difficult task of judging the candidates on their problem-solving skills and ability. 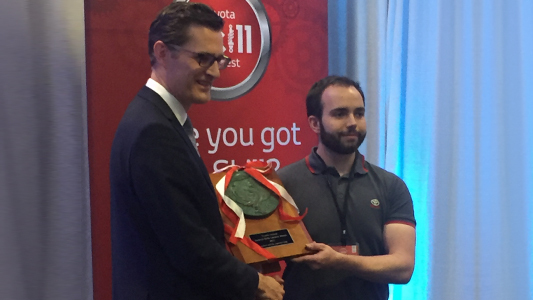 It was with great pride and in honour of outstanding performance during the Toyota Ireland Skills Contest that Stephen McConnell was announced as the winner.